Episode 1: Gideon, Reluctant Hero -- The Hebrew people have forgotten about the mighty God of their forefathers. They are being lulled into idol worship by the Midianite conquerors. God calls the young man Gideon to stand up to these oppressors and their false gods. This story will challenge you to lay aside your idols and worship the one true God. Episode 2: Gideon, Warrior by Faith -- An angel has told Gideon he will free God's people from the Midianites. But, with no army and facing outrageous odds, Gideon finds it hard to believe and even harder to act on faith. 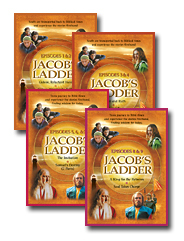 Watch as God gives Gideon just what he needs to strengthen his faith. In the process, Gideon learns to depend on God to do the impossible. Episode 3: Naomi and Ruth -- A severe drought has brought famine to the land of Canaan. Elimelech and his wife, Naomi, have no choice but to leave all that they know and venture to Moab. There they are not welcome and new hardships await. Lessons about facing trials through faith and building healthy communities that reach out to outsiders come through in this powerful story where conflicting cultures clash. Episode 4: Ruth and Boaz -- Naomi and her daughter-in-law, Ruth, arrive back in Canaan to face a harsh reality. With no home and no money, these two widows need a plan for survival. Hard work, the law of the Lord, and a steadfast faith will all play a part in their success. Episode 5: The Invitation -- Hannah has promised to give her son to God. Now that Sammy knows of his amazing birth, he must choose whether to accept God's plan for his life. Explore how free will interacts with following God's calling in this story. Episode 6: Samuel's Destiny — Part 1 -- As the priest Eli's right-hand man, 13-year old Samuel works hard in the temple. Meanwhile Eli's two sons sink deeper into a life of sin. How will these contrasting choices impact the Hebrews and their covenant with God? Episode 7: Samuel's Destiny — Part 2 -- As he begins to hear from God, Samuel transitions into the role of prophet. Meanwhile, the Israelites are marching into battle with the Ark of the Covenant, but without the Lord of Lords. What will it take to convince them to repent and put their faith in God? Episode 8: A King for the Hebrews -- Samuel has been a faithful prophet and judge of Israel for many years, but the people are increasingly dissatisfied. Attacks from surrounding nations have fed their desire for a king to lead them. Will the fledgling nation ever learn to trust in God alone and thank him for all He's given them? Episode 9: Saul Takes Charge -- Since the shy farmer, Saul, has become the king of Israel, his family has noticed some changes. His newfound power and status leave him little time to consult with God, and there's no telling who will be the next target of his suspicions and anger. How far should we follow if our leaders take a wrong turn? This and other lessons come through in this story. Episode 10: The King Needs Help -- King Saul has serious bouts of depression and David, a shepherd boy, is invited to come and play his lute for the king. Unbeknown to the king, David has been anointed by Samuel to be the next king of the Hebrews. The Casluhite army prepares for yet another attack, but a battle is avoided by having two champions fight on behalf of the two sides. Goliath, the Casluhite champion, is so overpowering that no Hebrew can be found to fight him. When David visits his brothers on the battlefield, he offers to fight Goliath. David kills the giant and is taken to the king's palace. The royal princes and princesses are all very impressed with David, but secretly, King Saul is jealous of the young champion. In a moment of madness, Saul might kill the boy who's just saved the country. Episode 11: Death Waiting -- After the event of the young David beating Goliath the giant, some ten years have passed. On occasion David still plays his lute for King Saul. Meanwhile, he has become a leading officer in the king's army. He is very successful and greatly loved by the people. King Saul has become a bitter man. He feels threatened by David's popularity and secretly plans David's demise. Episode 12: David on the Run -- King Saul wants David dead but has failed to get him killed on the battlefield. In his madness, Saul throws a spear at David while he plays the lute for the king. David runs for his life and finds refuge with Samuel the prophet. Episode 13: A New King -- King Saul is in hot pursuit of David, who is hiding in a cave. When the king walks into the cave, David has the opportunity to kill the man who is trying to kill him. Instead, David secretly cuts off a piece of the king's cloak. Shortly afterwards, David confronts the king from a high rock and begs King Saul to stop hunting him down. Saul is completely taken by surprise. He cancels the chase and invites David to join him on his way back to the palace, but David knows that he just cannot trust King Saul. Time: 6 hrs. 30 mins.